Talula's: The Toughest Reservation in the U.S.? When foodies hear the phrase "tough reservation," they might think of the French Laundry in Napa or Le Cirque in New York, both known for their six-month waiting lists. 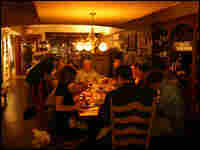 They're a snap compared with Talula's Table in the historic Pennsylvania town of Kennett Square. Talula's: The Toughest Reservation in the U.S.? Currently only one group a night can try this risotto. 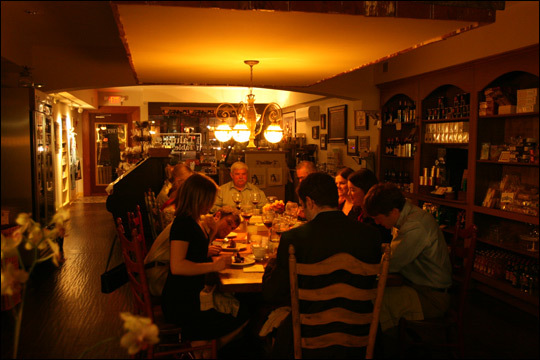 Up to 12 people can fit around Talula's Table each night. 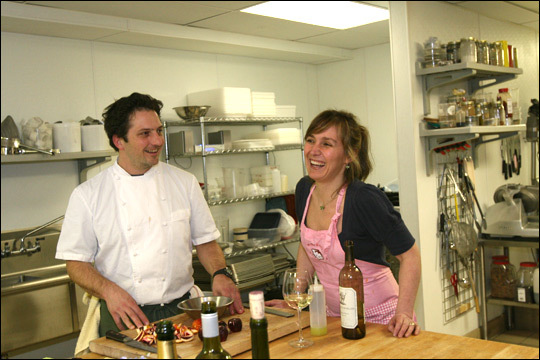 Husband-and-wife proprietors Bryan Sikora and Aimee Olexy run Talula's Table. 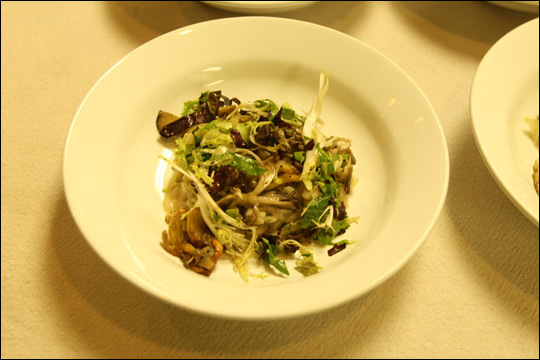 Rigatoni with snails is one of the seasonal specialties that customers wait a year for. When foodies hear "tough reservation," they generally think French Laundry in Napa or Le Cirque in New York — both known for their six-month waiting lists. That's a snap compared with a spot at Talula's Table. Located in historic Kennett Square, a Pennsylvania town some 35 miles south of Philadelphia, Talula's requires a full year's wait — if you can get a reservation at all. By day, Talula's is an upscale market, filled with luscious cheeses, mustards and fresh-baked breads. In the evening, when the market closes its doors, it's a different story. A single farm table becomes center stage for one of the country's most exclusive dining experiences. A dozen lucky people gather around it to share an eight-course meal that runs from egg custard with Jonah crab to osso bucco made from pork, all prepared with local ingredients by husband-and-wife proprietors Bryan Sikora and Aimee Olexy. Because of the restaurant's popularity and its single nightly seating, Olexy has devised a special system for selecting diners. Though the phone often begins ringing with requests at sunrise, she does not pick it up until 7 a.m. on the dot. The caller is then offered a reservation exactly one year later. Requests for earlier or later are denied, as are attempts to play the VIP card to skirt the procedure entirely. These rules keep booking simple, Olexy says. Sikora, the main chef, says he hopes to open a more traditional restaurant in Kennett Square one day. It's unlikely that Talula's customers are craving a larger venue, however. "The food is tremendous, and the fact that you feel like you are eating in your own living room is wonderful," said Tray Katzenbach, who sampled the fare on a recent evening. New York actor John Turturro, known for films such as Quiz Show, is also a fan. 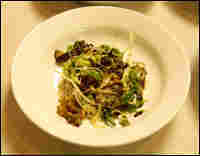 "Each dish was a separate love affair," he told Portfolio.com. "It was the kind of a meal you'd request before your execution." Combine water, cream and buttermilk in large, heavy saucepan. Bring to a boil over high heat, stirring occasionally. Reduce heat and stir in cornmeal, simmering for 15 minutes. Remove from heat and stir in butter. Transfer mixture to stand mixture fitted with paddle. Beat at medium speed until mixture has cooled to lukewarm. Beat in eggs, one at a time, until incorporated. Add baking powder, baking soda, salt and grated Parmesan cheese. Lightly butter muffin tin with 12 wells. Place strip of ham in each well, then spoon batter until nearly level with top. Bake at 350 degrees F. for 15 minutes or until lightly browned. Meanwhile, prepare spicy greens, mushrooms and — when spoonbread has been removed from oven — the shrimp. 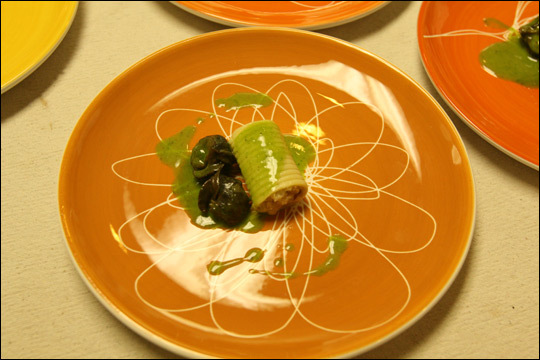 To serve, spoon some creamed greens on center of plate, allowing it to pool. Top with spoonbread and sautéed shrimp and mushrooms. Drizzle with remaining cream sauce. Heat butter in skillet over medium-high heat. Stir in greens, cooking just until wilted. Stir in cream and garlic, bringing just to a boil. Reduce heat and simmer, stirring frequently, for 5 minutes. Heat oil and butter in large skillet. Stir in mushrooms and cook 1 minute, stirring frequently. Add shrimp and continue stirring, frequently, until shrimp turns pink and becomes slightly firm, about 2 to 3 minutes. Remove from heat immediately.